Backup to DVD software solution helps you protect important data from HDD failures, system malfunctioning and other “local” disasters. DVD backups enable you to quickly insert a disc and restore a needed version of your files. 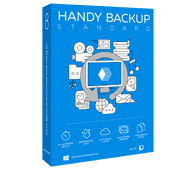 Handy Backup allows you backup to DVD in the 32-bit product version. Our product is designed for Windows 10/8/7/Vista and Windows Server 2016/2012/2008. It can also serve as DVD data backup software for different distributives of OS Linux. After running the installation process, please select the “32-bit” mode in the Installation Wizard screen. Note that installation software will automatically select an appropriate version for your system; if you do not force the change from 64-bit to the 32-bit solution, you will not obtain a DVD backup software plug-in! Handy Backup supports backup files to DVD discs of all kinds including DVD-R, DVD+R, DVD-RW, DVD+RW. When you select CD/DVD/Blu-ray, the program automatically detects the type of the disc and uses it for storage. You can back up individual documents, hard disk images, system files, SQL databases, and much more - depending on the edition you use (and yes, you can perform DVD data backup for any data source). To store DVD data backup in the most efficient way, you can use compression, encryption, and other options. Flexible scheduler lets you back up absolutely automatically - just don’t forget to change the discs when they are full! Compare editions of our backup software. To back up to DVD you need any edition starting with Handy Backup Standard. Note: for disk imaging and other advanced features, you need Professional edition or higher. To backup files to DVD, make sure your computer is equipped with a DVD-R drive. Our software supports all types of CD/DVD/Blu-ray discs and the respective burning devices. Firstly, you select files, folders and other data that you want to back up to DVD. Then you select CD/DVD/Blu-ray as backup destination. Full backup merely copies selected data to DVD disc. 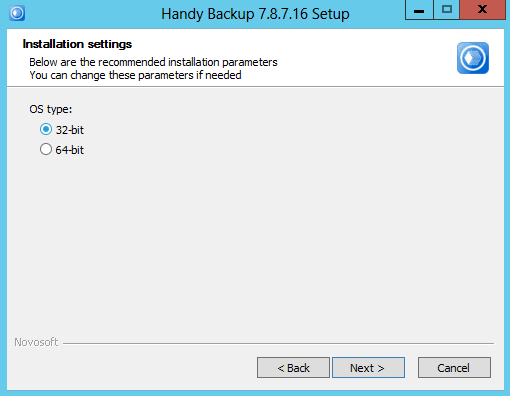 Incremental backup copies changes since previous full or incremental backup. Differential backup copies only changes since the most recent full backup. 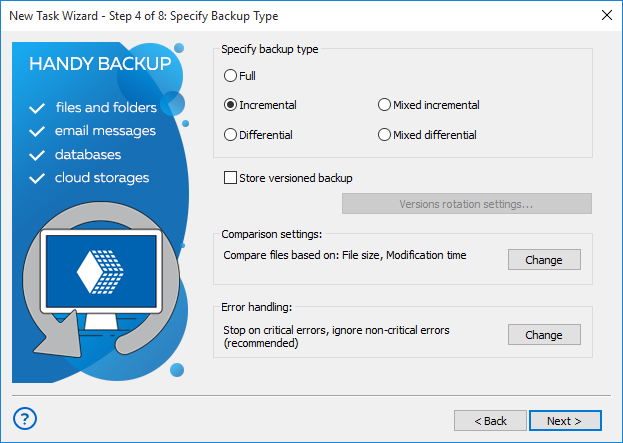 Mixed backup makes a copy of your data, and when perform several differential backups. After making a set quantity of repeats, it will make a new full backup, repeating all cycle again. Other steps are optional: you can enable compression, encryption, scheduling, etc. That’s all you need to do to have your PC backed up! We welcome you to download the program and test the power and simplicity of backing up to DVD yourself. Try free for 30 days! Burn your backups to DVD with Handy Backup software automatically, easily and reliably!